Was William Shakespeare born early enough to enjoy the delights of a cup of tea? And did he wear a top hat? Britains first Prime Minister was surely at a later date, but was that before or after the Great Fire Of London? These are the kind of questions that players face in Timeline British History. 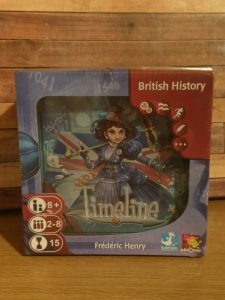 Timeline British History is a card game for 2 or more players with a difference from Esdevium Games in the United Kingdom and Asmodee Games in the United States. 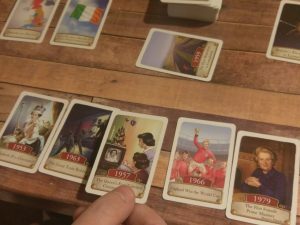 Each turn players take it in turns to place one card where they think it goes in the timeline before turning it over to see if they are right, the aim of the game is to be the first player to play all of your cards. 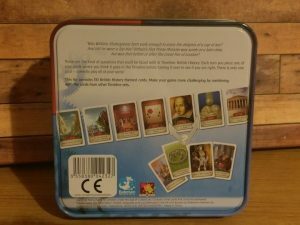 The instructions are really clear and the game takes only 5 minutes to learn, the age guide of the game is 8 years +, however, whilst it would be easy for a child of that age to grasp the rules and how to play I’m not sure they’d have the knowledge needed to play successfully and a more appropriate age would probably be 12+. 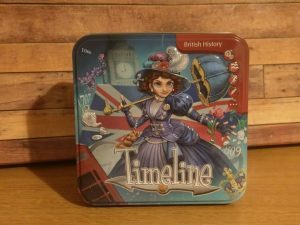 The game comes packaged in a vintage style tin which contains 110 British History themed cards, the box is well designed and the cards are kept secure but at the same time are easy to remove from the box, thanks to the lovely touch of a lip to enable you to pick the cards up easily. The design doesn’t stop there, the cards are of a really high quality and have a canvas feel to them, the artwork on the cards is lovely too and has an oil painting feel to it. 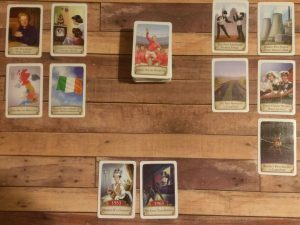 We had a lot of fun playing timeline, and whilst it could be sold as an educational game we thought that it was just a fun game to play. This entry was posted in Card Games, More.